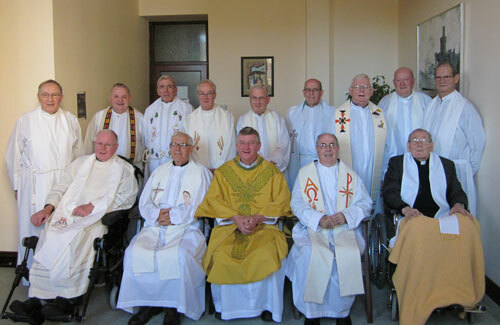 This year the Irish Province gives thanks to God for the faithful service of the 14 surviving members of the 1960 Ordination class. Fr Fachtna O’Driscoll SMA, Provincial Leader, led the Concelebrated Mass in the St Theresa’s Oratory at the SMA Mother House on the Blackrock Road, Cork. The homily was preached by former SMA Superior General and now Bishop of Killaloe, Rt Rev Kieran O’Reilly SMA. More than 40 priests participated in the Mass and at a celebration afterwards. Front row (left to right): Frs Michael McEgan, John O’Hea, Fachtna O’Driscoll (Provincial Leader), Andy O’Sullivan and Tom Mullahy. Back row: Eamonn Kelly, Bill Foley, Michael Darcy, Hugh Harkin, John Quinlan, Terry Gunn, Oscar Welsh, Eddie Deeney and Bill Ghent. 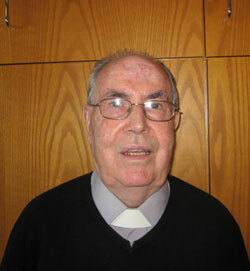 Fr Sean Kilbane SMA was absent due to ill health. There were 24 in the Ordination class. Fr Oscar Welsh, due to his young age, was not ordained with his classmates and had to wait until June 1961 for Priestly Ordination. Eight of them have gone to their eternal reward and two others are happily married. After ordination, most were appointed to Africa – Nigeria being their first assignment except the late Fr John Breheny SMA who was appointed to Liberia. Three were sent for Higher Studies and one was appointed to the SMA Minor seminary at Ballinafad. In later years some of the class were appointed to other missions, in Africa and beyond, including Kenya, South Africa and Argentina. Several Irish dioceses benefitted from the service of some of the class when they took up appointments in various parishes at home. Many of the Jubilarians are now holding or have held various administrative posts in the Society. Some are also carrying the cross of ill health in recent years, a fact which Fr O’Driscoll mentioned in his speech during the celebratory lunch. Two of them are still in pastoral ministry in Nigeria – Fr John O’Hea (pictured left) in his 50th year in the Archdiocese of Ibadan. 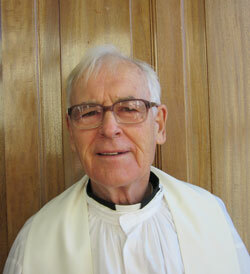 During these years, Fr John has been heavily involved in the Catechetical ministry. Fr Andy O’Sullivan (pictured below) first served in education and pastoral work in Ondo diocese before taking up a position in the SMA Formation House in Ibadan. He later transferred to the Archdiocese of Lagos where he served in St Joseph’s Parish, Gowon Estate. He is now responsible for the Sacred Heart Parish, Apapa, Lagos. But this Anniversary is also a time to give thanks to the Lord of the Harvest who has touched the hearts of hundreds of thousands of people who support the SMA and our missionary work – our FVC Sponsors, those who use our Missionary Association Cards, shopkeepers who place an SMA Mission Box on their counters, those who contribute to our Novena appeals…. so many people who through prayer, financial support and their personal sacrifices help us to be their representatives in many parts of Africa and beyond. Our Jubilarians all referred to our SMA supporters who have helped them during their missionary life, both in Africa and at home. To each and every one of you: Go raibh míle maith agaibh go léir! pray for each and every one of us.